Provenance: ? Christ Church Canterbury: evidence of an initial with an archbishop wearing a pallium (f. 2); and by the script of one of the scribes (ff. 28-49v), identified by T. A. M. Bishop as being that of Eadui Basan, a Christ Church Canterbury scribe. Perhaps commissioned by Aelfric, archbishop of Canterbury: he bequeathed it to Wulfstan, archbishop of York in 1003 or 1004. A-f.69r; B-f.73; C-f.25; D-F f.68r; G-f.69r; H-f.25; I-f.29v; J-f.73; K-L f.25. This and similar manuscripts are believed to be copies of a Carolingian psalter [the Utrecht Psalter]. 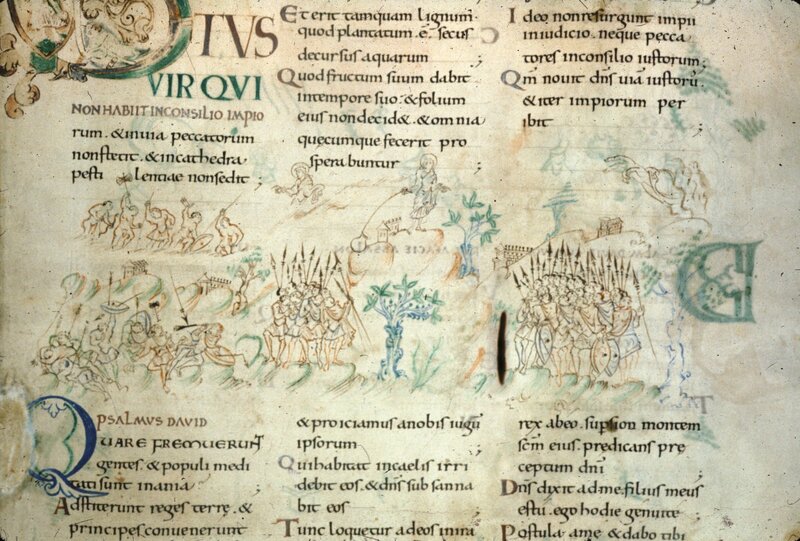 They use the same agitated linear style, but are clearly not following all the details of military equipment shown in the original manuscript. Not only are kite-shaped shields shown (D and L). but so are tall saddles with raised pommel and cantle, almost exactly the same as seen in the Bayeux Tapestry (I). Another horseman has a straight-legged riding position and a very long cavalry sword (A). Other features are more old-fashioned, including many round shields (B, C, E, F, H, K and L) and the throwing of javelins (A, C, K and H). Such a mixture of old and new would not be surprising in the early to mid-11th century. The angel using a bow (J) is ultimately copied from a southern European original, whereas the armoured figure (B) might reflect the best equipped huscarls of the period. He has a conical helmet with a broad nasal and a mail hauberk without a coif but with short, broad, untailored sleeves.